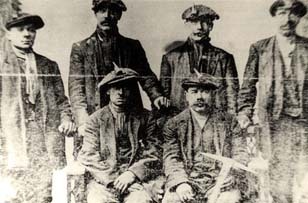 A group of Lithuanian miners finally arrived in Sangamon County around 1900, via Scotland and Pennsylvania, and were joined by many fresh immigrants here. Most of Springfield’s Lithuanian immigrants of this period settled near the coal mines on the north and east side of the city. Here, as in other communities where they felt secure enough to settle, they signaled their intent to form a community by building their own Roman Catholic Church. The greatest influx of Lithuanians to Springfield, as measured by the increase in membership at St. Vincent de Paul Lithuanian Catholic Church, occurred between 1909 and 1914, when the beginning of World War interrupted immigration. This Lithuanian immigrant community, including wives and numerous American-born children, numbered several thousand in Sangamon County at its peak around 1917. A Nov. 5, 1918, article in the Illinois State Journal noted that there were about 3,000 Lithuanians living in Sangamon County at that time, with about 1,500 living in Springfield. My Grandfather John J. Straukas came here from Lithuania. He lived in Riverton with his Great Aunt. Lulu Grigiski.